fastjet is pushing ahead with expansion plans to create a pan-African low-cost carrier network, adding two more routes to its Tanzania domestic network in Mar-2013, applying to operate its Fly540 between Dar es Salaam and Johannesburg and continuing to negotiate a deal to buy South African LCC 1time from its liquidators. London Stock Exchange-listed fastjet will launch daily services to Kilimanjaro to Zanzibar and Mwanza on 18-Mar-2013, increasing its network by 50%. The carrier launched in Nov-2012 with two routes from Dar es Salaam to Mwanza and Kilimanjaro. The carrier is, however, dealing with a raft of claims relating to the troubled takeover of Five Forty Aviation operations ranging from outstanding debts, including unpaid aircraft leases, airport fees, bank guarantees and taxes. 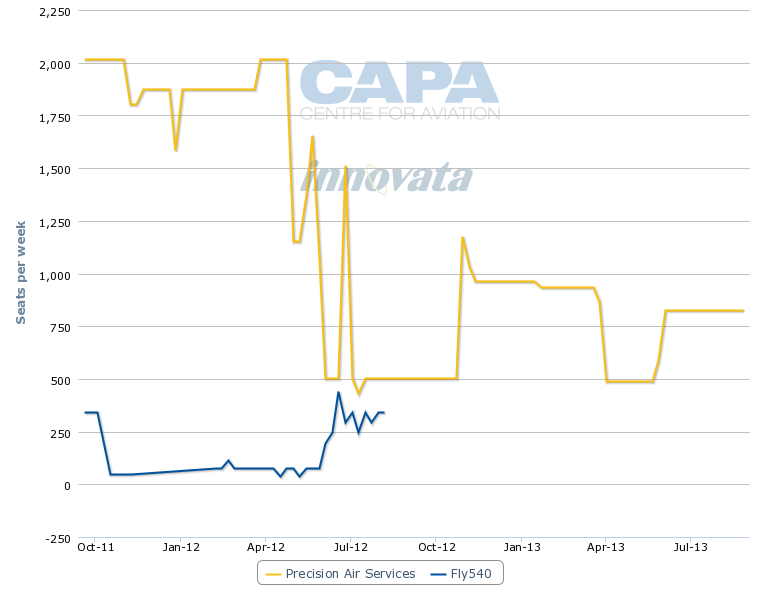 The Kilimanjaro-Zanzibar route reinstates a service operated by Fly540 Tanzania until Aug-2012, while the carrier pulled off Kilimanjaro-Mwanza in Nov-2011, according to Innovata. fastjet will operate daily on both routes, offering up to 1,092 one way seats per week on each based on capacity of between 145 and 156 seats on board its A319s. fastjet will compete on both routes against Precision Air which offers 936 one way seats a week on Kilimanjaro-Zanzibar and operating twice daily with ATR72 and ATR 42 turboprop aircraft. Precision also operates a daily ATR72 service to Mwanza offering 490 one way seats per week. Precision has approximately halved its capacity on the route since Fly540 withdrew its service. Fly540 Tanzania continues to operate from Dar es Salaam to Mombasa and Nairobi. But as both these markets have been identified as future routes for fastjet they are likely to be dropped by Fly540 in 2013.
fastjet is seeking authorisation to allow Fly540 Tanzania to operate daily from Dar es Salaam to Johannesburg. fastjet is set to enter the Kenyan market soon, having signed a memorandum of understanding (MOU) with collapsed local carrier Jetlink Express in Jan-2013 to establish a joint venture. Jetlink suspended operations in Nov-2012 after cash flow issues, resulting from being unable to access about USD2 million funds held in a bank in South Sudan. fastjet operates a fleet of three leased A319s, two of which are 13 years old and the other nine years. fastjet expects to deploy at least five A319s by Jun-2013, building to a fleet of up to 15 of the type by the end of 2013.
fastjet is continuing to negotiate to buy failed South African LCC 1time from its liquidators and is confident it can secure acceptable partnership arrangements to ensure any change of control of 1time would comply with current South African foreign ownership laws. Those laws limit foreign ownership of a South African airline to 25%. However, fastjet has applied to South Africa’s Minister of Transport, Ben Martins, to exercise his power to grant an exemption to the regulation. fastjet plans to relaunch 1time under the fastjet brand with initial services between Johannesburg, Cape Town, Durban, Port Elizabeth and East London. 1time had about 15% of the South African market before it was placed in provisional liquidation. 1time liquidators Tshwane Trust has also extended the liquidation process a second time until 02-Oct-2013 to allow time for the fastjet deal to be concluded. fastjet has reportedly submitted an amendment to its application dealing with the Broad-Based Black Economic Empowerment (BBBEE) component of the company. The airline plans to sell a 25.1% shareholding to a black empowerment partner at a later stage, according to Business Day Live. fastjet is hopeful that a deal can be finalised and expresses confidence that an acceptable solution can now be put to the Liquidator so a meeting of creditors might be called. 1time creditors are collectively owed about ZAR500 million (USD54.9 million). fastjet chairman David Lenigas said: "We see a real opening in the Southern African marketplace for a true Low Cost Airline such as fastjet right now and although we have met with stiff opposition from other South African carriers, we feel that the South African flying public will be the true beneficiaries of the added seat capacity we intend to offer. “Airfares in South Africa appear to have skyrocketed since 1time ceased flying at the end of last year, and many planes are operating full to capacity on the key Cape Town and Durban routes,” he said. South African carriers have strongly objected to the fastjet’s proposed entry. Comair, which operates as British Airways and LCC Kulula, is concerned that granting fastjet an exemption to the foreign ownership rule would give the airline an unfair advantage by allowing it to take up bilateral capacity rights at both ends of markets to and from South Africa. Other South African carriers could only access the South African rights. Such a decision could also set a precedent for similar requests from other international airlines, according to Comair. SkyWise has been granted an air services licence as it prepares to launch operations in the second half of 2013, starting with three-times daily Johannesburg-Cape Town route with two leased Boeing 737-300s. Durban and Port Elizabeth-East London routes are also planned. The carrier still needs to gain an air operator's certificate before it can launch services, which may require two more aircraft. SkyWise reportedly plans to reduce fares by 20% and is aiming for a 6% market share in two years, with finance director and former 1time executive, Glenn Orsmond arguing that the demise of 1time removed two million seats from the market resulting in a “massive shortage of cheap seats”. fastjet’s market entry has been particularly turbulent due to an escalating dispute with Five Forty Aviation CEO and founder of Fly540 Kenya, Don Smith. fastjet has turned to Britain’s High Court to gain a ruling that it has fulfilled all its obligations under the June-2012 Sale of Purchase Agreement between fastjet (formerly Rubicon Diversified Investments) and Five Forty Aviation, and is the sole owner of the Fly540 brand. Mr Smith claims that he is still owed USD6.78 million relating to inter-company debt owed to Kenya’s Chase Bank which fastjet had pledged to repay. Mr Smith in Feb-2013 withdrew fastjet’s right to use the Fly540 brand for its operations in Angola, Ghana and Tanzania claiming unpaid licence fees and failure to provide safety and financial compliance documents information. The carrier in Mar-2013 secured funding of GBP15.7 million (USD23.4 million) to cover expansion in Africa over the next 12 months through convertible securities issued to Bergen Global Opportunity Fund. The convertible securities will be issued in six tranches of GBP2.6 million (USD3.9 million) each over 11 months and have a term of between 18 months and 15 months. fastjet CEO Ed Winter said the agreement gives the carrier: "access to very significant funding over the next year on a flexible basis and will provide us with a solid platform on which to grow the business and expand our operations in Africa". The funds are in addition to GBP4 million announced in Feb-2013 to increase working capital through a combination of a subscription with an existing institutional investor and other investors as well as a draw down on its GBP5 million Equity Financing Facility (EFF) with Darwin Strategic Limited. fastjet has the funding in place to escalate the growth plans it has been forced to adapt as the carrier comes to grips with the difficult African market and attempts to seize opportunities in markets ripe for low cost competition such as South Africa. But network expansion will be slow as it negotiates a way past the protectionist mindset of African governments and the underlying high operating costs not suited to the traditional LCC model. But as an early mover on a continent regarded as the last frontier in aviation, fastjet could become a driving force that helps to unleash Africa’s massive untapped economic wealth. Providing affordable intra-continental air travel to the continent's growing middle class offers massive upside – but it also faces massive inertial forces.